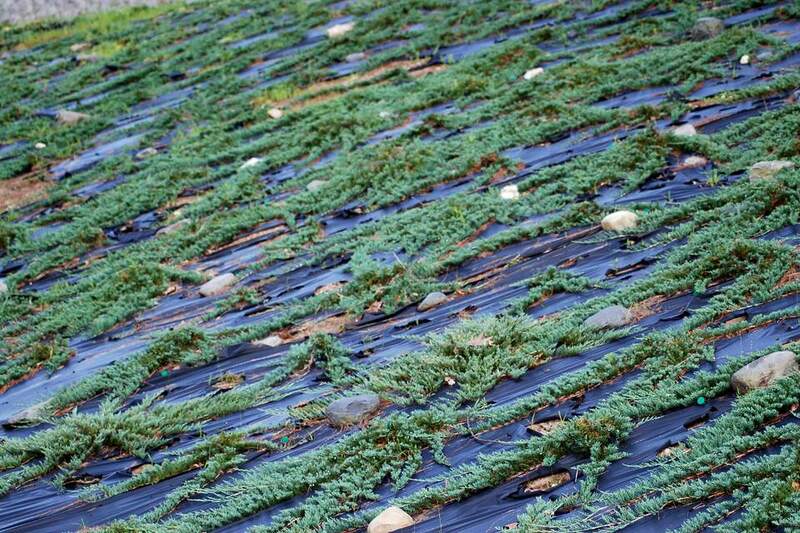 Blue Rug Juniper is a drought-tolerant ground cover that craves fast drainage. Because so many other plants find it difficult to thrive on sunny slopes, where water runs off so quickly that plants are apt to go thirsty, this juniper cultivar is a practical solution. Blue rug junipers (Juniperus horizontalis 'Wiltonii') are an evergreen plant that grows only 6 inches tall but can spread 6 to 8 feet wide in a moderate quick period of time. It's a hardy plant that can adapt to snow and frost, as well as rocky and thin mountain soils or fluctuating temperatures and sandy soil of deserts. Blue rug junipers are also resistant to deer. The foliage of a Blue Rug Juniper is a silvery-blue, thus the first half of its common name. Its foliage turns a purplish-bronze in winter. The second half of the name comes from its growth habit, as it forms a dense, low mat, making it an ideal ground cover. Although no plant is "no-maintenance," the Blue Rug Juniper is certainly low-maintenance. Ground covers that flower requires much more care than the coniferous types like this plant. Blue Rug spreads rapidly, making it ideal for homeowners who are in a hurry to install ground covers on an incline to control erosion. Space these plants 4 to 6 feet apart to form a dense enough mat to crowd out weeds. This ground cover is fairly resistant to some of the diseases that trouble juniper shrubs, but spider mites can present a problem. Control spider mites on mature plants by hosing them down once in a while in summer with a firm spray. This will disrupt their web-making work. Blue rug junipers thrive in full sun but can tolerate part-shade. However, these ground coverings can't tolerate full shade and will end up growing very thin. Blue Rug Junipers prefer dry, sandy soil; however, they can tolerate a wide range of conditions and soils, as long as it's well-drained. Before planting, prepare the ground with soil amendments. Those who garden in communities near the ocean will be glad to learn that these are salt-tolerant plants. This quality comes in equally handy if you live where it snows a lot in winter and roads are often salted. To aid junipers' weed-control efforts prior to maturity, make sure that they are well mulched (but do not pile up mulch over the plants' crowns). In fact, for better weed control, some people grow Blue Rug juniper in a bed covered with black plastic, poking holes in the latter to make room for the ground cover. Until the Blue Rug Juniper matures, it's critical that it has evenly moist soil. For six weeks after planting, water the juniper every two to four days. After that, water it once per week only during the weeks that it hasn't rained. Blue Rug Junipers can grow in a variety of temperatures. However, it's best planted during the cooler fall, winter, or early spring months when the temperatures are regularly below 60 degrees Fahrenheit. Fertilize the plant once in a while with manure tea if it looks like your ground cover could use a boost as the years go by. Take cuttings from blue rug juniper plants between late June and October. The cuttings are slow to root and can't be moved for approximately a year. Blue rug juniper doesn't really need to be pruned unless the growth has become unruly or the plant has been affected by a disease. However, you can contain the juniper from spreading too far by keeping it trimmed. This also encourages branching and robust growth. Prune the juniper only during the spring months when the weather is dry. Many varieties besides Blue Rug juniper plants are suitable for ground covers. All want full sun and a soil that drains well. The Prince of Wales cultivar of J. horizontalis is green and grows even more quickly, while another cultivar, Mother Lode, bears greenish-gold foliage. The Pancake cultivar stays smaller than these, both in terms of height (an amazing 2 to 3 inches tall) and spread (2 feet). The Nana cultivar of J. procumbens has a height of 8 to 12 inches and a width of 6 feet, at maturity. The foliage is grayish-green or bluish-green. Grow it in zones 4 to 9. The Blue Star cultivar of J. squamata provides another choice for those who seek that cool blue foliage. But Blue Star juniper will get taller over time (up to 3 feet) than Blue Rug and does not spread as much, proportionately (4 feet). J. chinensis Sargentii is 18 inches to 2 feet tall at maturity, with a width of 7 feet. It bears green foliage and is suited to zones 4 to 9. J. conferta Shore Juniper is so called because it tolerates the poor soils typical of coastal areas. Its height is 12 to 15 inches, its spread 8 feet. The leaves are greenish-gold. Grow it in zones 5 to 9.